You have decided to sell your investment property. You are considering listing it with a realtor. While there can be many pros when you enlist a realtor to sell your property, there are also certain negatives that you should be aware of. Here are the cons to consider when listing your investment property with a realtor. The first negative of listing your investment property with a realtor is that you have to pay the realtor’s commission. You can expect to pay anywhere between three percent and ten percent as a commission. The amount of the commission will depend on a number of factors, such as the value of the home, as well as the terms of the contract that you negotiate with the realtor. When you factor in a realtor’s commission, it can quickly eat into any potential profit you would make on the sale of the investment property. As an example, a realtor is charging a 10 percent commission. The sale price of your property is $500,000. This means the realtor stands to make $50,000 as a commission. If you factor in the $425,000 in loans that you have to pay off with the sale of the property and the realtor’s $50,000 commission, you will only make $25,000 from the sale. That is half of what the realtor will make! You have to determine if the benefit the realtor brings is worth their cost. Another downfall of listing your property with a realtor is that you can be locked into a long-term contract. Many realtors will not take your business unless you agree to do an exclusive listing with them. This means that you cannot list the property with anyone else until your contract with them expires. For example, a realtor may require a three month exclusive listing with them in order to agree to take on your business. Signing a long-term contract can be a bad thing if you decide that the realtor is not right for you. You may feel the realtor is not working hard enough, has not priced the listing accurately or you just may not get along with them on a personal level. 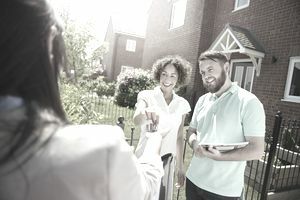 It can be difficult to get out of a contract without legal ramifications, so you may be forced to wait out the duration of the contract while your property sits on the market. If possible, you may want to do a one month test listing with a realtor to see if you feel comfortable with them before committing to anything more long term. You can also elect to work with realtors who do not require exclusive listings, however, the pitfall here is that these realtors may not make your listing a main priority. Another issue you can encounter if you list your investment property with a realtor is that they list the property at the wrong price. Overprice: The realtor may price your property above the true market value of the property. Many realtors do this to give some wiggle room for negotiations. However, if the listing price is too high above market value, prospective buyers may not even bother viewing the property. The longer the property sits on the market, the staler the listing gets and you may have a harder time finding a buyer without significantly lowering the price. Underprice: A realtor could list your property under the true market value of the property. This could be because the realtor does not know the true market value of the property because there are not a lot of available comps or because they are trying to get the property sold quickly. Either way, this lower listing price is cutting into the potential profit that you could make on the property. Especially with the large commission that a realtor commands, you expect them to accurately price your property. Inaccurate pricing that could affect your profit is one negative of hiring a realtor. Realtors are salespeople. A realtor may lead you to believe that they have extensive experience selling multifamily properties. As the weeks pass, however, you come to realize that they have no idea what they are doing. Your property is sitting on market week after week and the realtor cannot find any interested buyers. If your investment property is a single family home or even a two family, it may be easier for realtors to find interested buyers. However, larger multi-families and commercial properties may require a realtor with extensive knowledge and contacts with buyers and sellers in this particular market. These types of properties can often be listed at property auctions. Just as there are accountants who specialize in tax preparation for investment properties, there are realtors who specialize in selling investment properties. The final con of listing your property with a realtor is that the realtor just may not be good at their job. They may have taken on too many listings and therefore are not able to devote adequate attention to your property. They may not have adequate knowledge of your property or of the neighborhood. They may be unprofessional in the way they deal with you or prospective buyers. They may be difficult to work with and rub you or prospective buyers the wrong way. They may just be lazy and put in little effort to get your property sold. Whenever you hire anyone to do anything, you are putting your faith in them and are trusting that they can and will deliver on what they have promised.